On the National Post’s blog, columnist Jonathan Kay reports that Justin Trudeau – son of the now-deceased former Prime Minister Pierre Elliott Trudeau (a father of Canada’s Canadian Charter of Rights and Freedoms) – shared with a questioner his opinion on whether Canada’s Charter would protect extraterrestrials, were they to (exist and) land in Canada. In a nutshell, he said that the Charter would apply if the alien first became a Canadian citizen. His response betrayed an ignorance of the Charter, given that several of its provisions apply even to those lacking Canadian citizenship. For the politically ambitious son of the Charter‘s most noteworthy father not to have spent more time learning about and understanding the Charter than, apparently, he has would be unforgivable…were it not for the fact that a bowl of Jello pudding bearing the Trudeau name would probably win the Liberal Party leadership – possibly even the Prime Minister’s chair – quite handily. 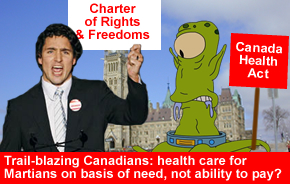 Never mind the fact that parts of the Charter apply to non-Citizens: socialized medicine will pose the greater problem should we be visited by “rights”-touting little green men (and womyn). You see, tax-funded (i.e., “socialized”, “universal”, “rationed”, “cruel”, etc.) medicine is available to all “residents”. One need not be a Canadian citizen (or even a taxpayer) to have ones noodly appendage put in a cast, or to have ones gender changed from fnork to dneeble. And I fully expect such visitors indeed to demand “free” health care. Ask yourself: have you ever known someone who is “green” on the outside not to be “red” on the inside? haha. well said my friend well said!